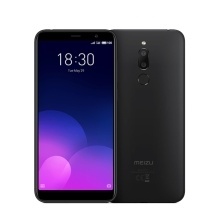 The Meizu 6T sports a a mainstream screen, 5.7-inch full-screen with an aspect ratio of 18:9, providing better visual experience, uses a MediaTek MT6750 Octa Core processor, integrated with the Android system and 3GB+32GB of storage to ensure smooth operating speed. Its dual rear camera and front-facing camera records the most fun in your life thanks to a combination of many of shooting modes, adopting fingerprint scanner on back, and better 3300mAh battery. MEIZU 6T provides a 5.7-inch full screen at a ratio of 18:9, making it easy to use even in outdoor environments, the wide viewing world on your palm. Meizu 6T uses a MediaTek MT6750 Octa Core processor, integrated with the Android system and 3GB+32GB of storage, making it suitable for both daily use and gaming, delivering a realistic game graphics and a smooth operating experience. MEIZU 6T has a 3300mAh battery and delivers a longer battery life and better battery performance. MEIZU 6T adopts a classic integrated colorful polycarbonate body, its surface coating guarantees durability and toughness. The rear 13-megapixel + 2-megapixel dual-camera combination equips the MEIZU 6T with portrait mode, and 8MP camera on the front, delivering excellent performance in low light conditions. Advanced fingerprint scanner designed on the back for easy use with either hand. NOT Global Firmware, But Meizu 6T supports multi-language. 3. What&apos;s the Languages of Meizu 6T? Support Global Multi-Languages, you can refer to the screenshoot of languages. Comes with original US Plug. Multilanguage Please check out the screenshot picture.